I wake a couple of times, but thankfully fall back to sleep. We are all up and about by 6.00am. A full 7 hours in bed! Tam goes to fetch coffee and we sit on a huge rock outside the hut to drink it and enjoy the early hours with few people around. It suddenly dawns on me what the collection of cabins reminds me of  a POW camp. Back in the hut Algy and Ginger are planning an escape tunnel. Although the temperatures are pushing 100° F during the day, it cools down to a very pleasant 68° F at night. By 7.30am we are raring to go, but the shop does not open until 8.00am so we cant get milk for the breakfast cereal we bought last night. Impatient as ever we knock breakfast on the head and walk the 1 mile up the road to the start of the Mist Trail. 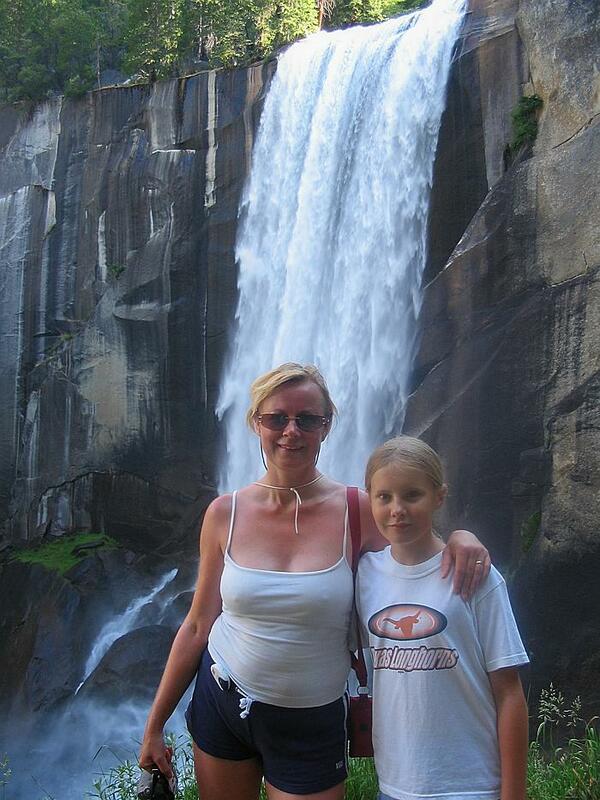 Its about 1.5 miles to the top of Vernal falls from there. It starts off easy enough, although much of it is uphill. As you come across the bridge over the river you get your first look at the falls. From here on things get a lot more hard work as it involves 700 steps to the top and some of them are very steep. Why can't they just put in an elevator? India has been whinging that she is tired and hungry, so I snap at her and tell her to stop moaning, as all good fathers would in such a situation. Half way up the steps she starts to feel sick. She decides to go back to the bridge while her guilty father and the others continue to the top. You climb along the side of the waterfall and the reason for the trail name becomes obvious as a light mist cools and dampens you as you climb. At the top you stand right at the very edge of the falls and watch the water pouring over the rim before thundering down onto the rocks below. Im so glad we arrived so early because we have not seen more than a dozen people along the way and there is only one other family at the top. We pass the Emerald Pool, which is a blue/green lagoon before the rapids disappear over the falls. Feeding this pool is a flat sweeping stretch of water that reminds me of the family raft ride at Blizzard Beach. I dont think youd want to take the last drop on this particular ride, its a cracker. 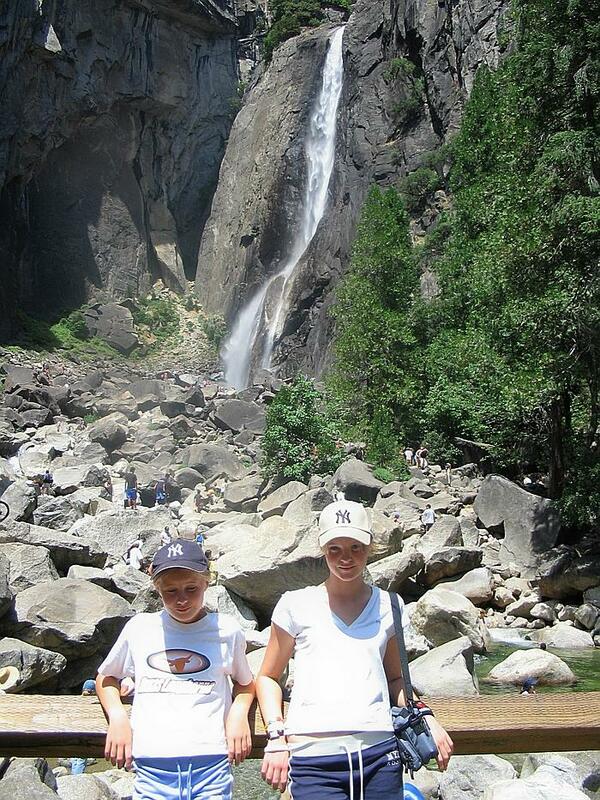 Clambering over rocks and around trees we round a corner and see Nevada Falls ahead of us. This is even higher and more powerful than Vernal Falls. You really do run out of superlatives to describe such amazing sights. The power and beauty is staggering. We start the descent. 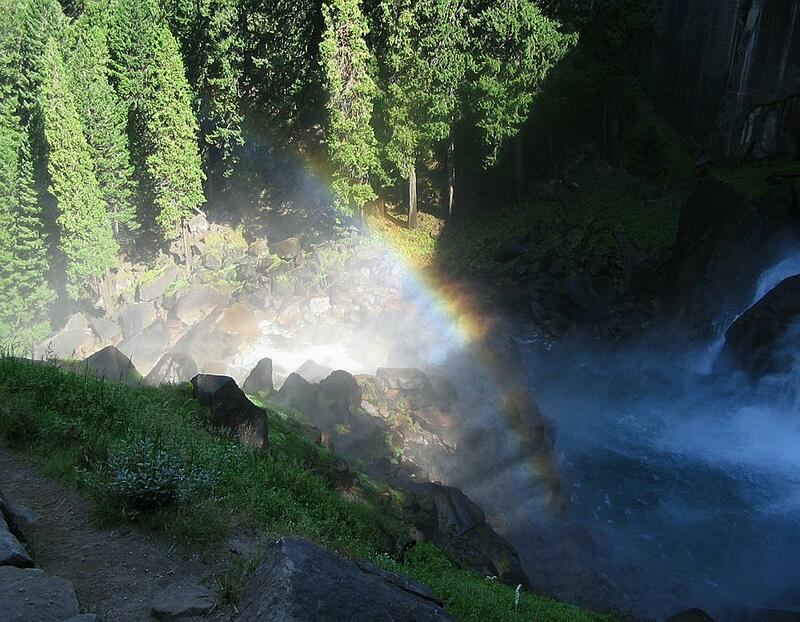 As we pass Vernal Falls the sunlight shines through the mist to produce a perfect rainbow. We pass many people going up as we are going down, so it really is a good idea to get here early if you want that wilderness feeling. Nearly an hour and a half after we left India we meet up with her again. She has been worried that she had somehow missed us. Guilt piles upon guilt. Only the promise of food recovers the situation. In total we have covered 5 miles, some of which was quite strenuous. At the start of the trail we catch the shuttle bus into Yosemite Village. Its a bit like the Disney buses, free and circulating every 20 minutes. We stop off at Degnans Deli where late breakfast/early lunch is taken and consists of 3 large rolls (ham, beef and chicken) split between us along with crisps and various small cakes. A large Coke finishes things off and all for $26. We have a little look around the village. Its not very big. Just a shop, café, post office, museum etc. 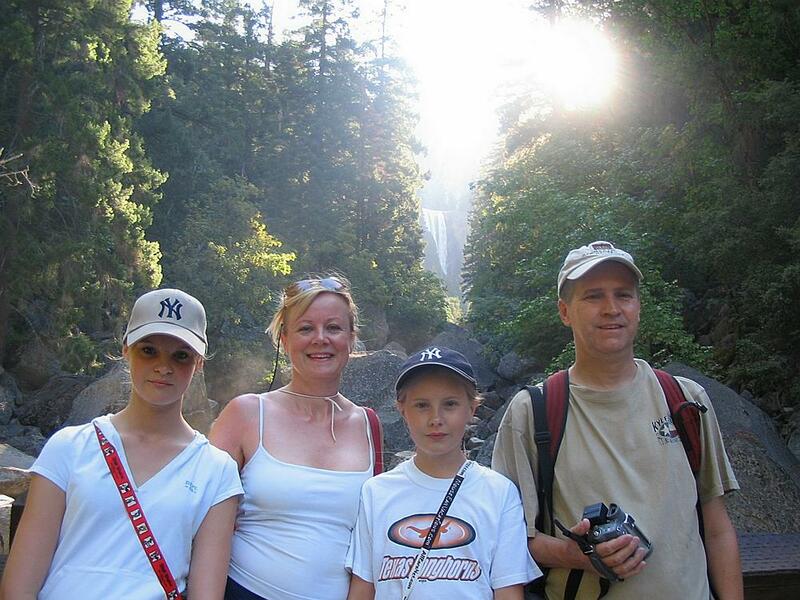 Next we walk to Yosemite Falls, which is under a mile away. As we go I make a silly comment and Im accused of being childish, so a discussion ensues as to who is the most childish. I have to remind the ladies of an incident a couple of nights before when we were packing to leave Cedar Grove. The suitcases needed fetching in order to pack and I asked Georgia to get the big brown one out. This strangely caused the woman to fall about laughing for several minutes, Now I ask you, is that normal behaviour? Having made my point and once again gained the moral high ground, we continue our walk to the base of Lower Yosemite Falls. The area is teeming with people, many of whom are clambering over the huge boulders and rocks right to the base of the waterfall. Yosemite Falls is really two connecting falls, Upper and Lower. 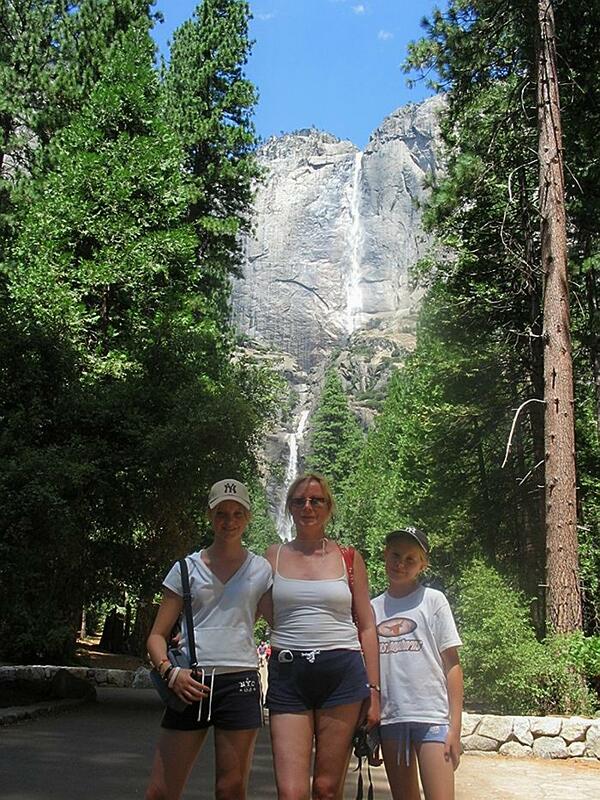 You can walk to the top of Upper Yosemite Falls, but it is several miles both ways. 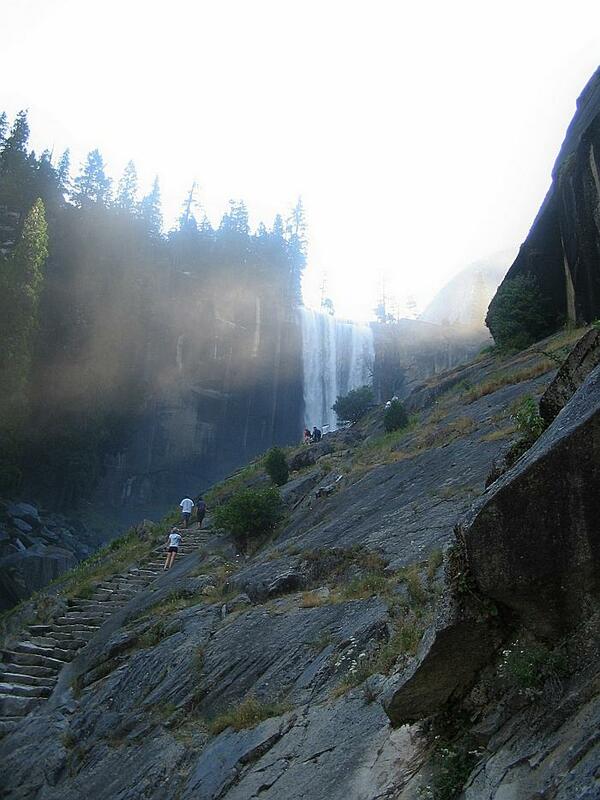 As we walk towards Yosemite Lodge we look back and you get a perfect view of both falls. We will be staying at the Lodge for one night on Wednesday, so we want to book a meal in the restaurant. That done, we hop aboard a shuttle bus back to Curry Camp. A swift change into swimwear and we are out the door again to rent a raft. This costs $72 for the 4 of us and involves paddling the inflatable raft down the Merced River for 3 miles. They then pick you up and bring you back to the starting point. In the Spring months I think this more of a white water experience, but we are lucky that they are still able to raft at this time of the year, it usually has to stop around July due to lack of water. It takes us about 2 hours to go the 3 miles and is great fun. 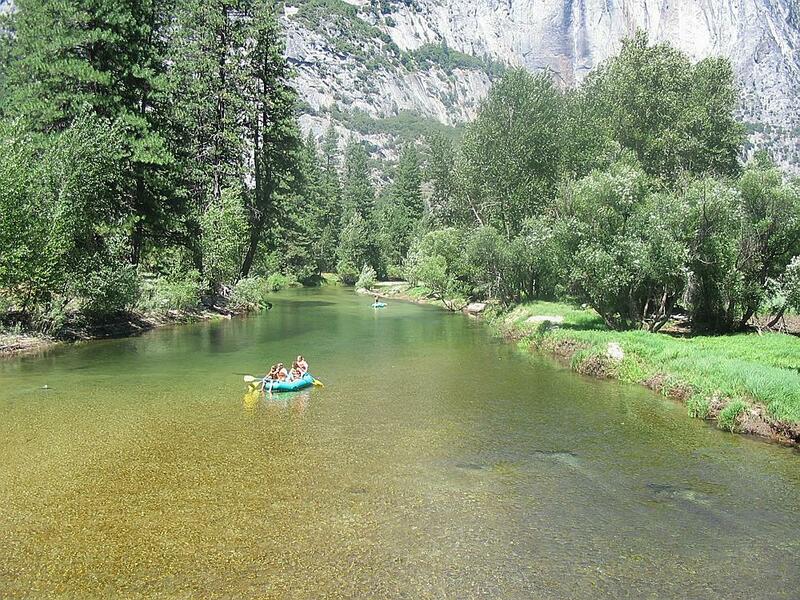 Floating down the river with huge cliffs either side of you is an experience that none of us will ever forget. Beautiful scenery, a cloudless blue sky and temperatures in the 90s, we drift along with me relaxing in the back, one foot dragging lazily in the water, barking orders at First Mate India and cabin Boy Georgia. Beats a Monday afternoon in the office, doesnt it? On the way back to the camp on the bus India and I have a rather annoying young child sat behind us who keeps asking his Dad questions that begin and end in the word why. Back at Curry Camp we drop off our gear in Stalag 272 and head for the pool for a refreshing dip. There is no downtime on holiday with the Stringers. Its fun and activities all day long whether you want it or not. After showering we go to the pizza terrace to eat. If I had a complaint about Curry Camp it would be that there are far too few dining choices and they definitely need to increase the number of tables available. Its like watching predators stalking their prey as people prowl, ready to pounce as soon as anyone shows the slightest intention of moving. One man got up to stretch and a family of 8 had claimed squatters rights before he had time to sit down again. We missed out in this particular lottery tonight and we were stood up attempting to juggle our food until a couple with a young baby took pity on us and offered us their table to share. The queue for the bar is depressingly long tonight. A sin in anybodys book. In fact I think its one of the 7 deadly sins. Im sure I remember something about long bar queues squeezed in somewhere between Gluttony and Sloth. After food the ladies are in the mood for some ice cream. Tam, being the conniving woman she is, offers to share a banana split with me. The reason that this is a particularly sneaky ruse is because she knows I will take a couple of mouthfuls before returning to the beer, thus leaving the rest to her. When she returns with a monster of a thing smothered in whipped cream and hot fudge sauce I know there is every chance she will eat herself sick. 8.30pm now and the entertainment options are limited. Not that theres anything wrong with this, the attraction here is the location, not the nightlife. Tam and the girls break out the cards while I write up my trip report. As they play a young American lad sits down in a chair next to them and strikes up a conversation. Before long he is helping India to play. Hes 17 and his name is Jordan. Never mind India, I think Tam is quite taken with him! It really is getting quite late now, almost 10.30pm, wed best be off to bed!